White thassos marble is a beautiful design choice for any home, but it carries a high cost that may turn off your customers. Whether you’re working on your own home or designing a new kitchen for someone else, it’s important to consider several materials before making your final choice. Looking at the pros and cons of different items can help you find the perfect building materials for your next project. While white thassos is an elegant choice, you may find that nano glass is a cost-effective, durable option that will also be a lovely addition to the finished design. Nano glass is an engineered product that’s actually known by several names in the industry. Here at Nalboor, we label it as full body or laminated Marmo glass. It’s also referred to as nano-crystallized glass or just nano glass. 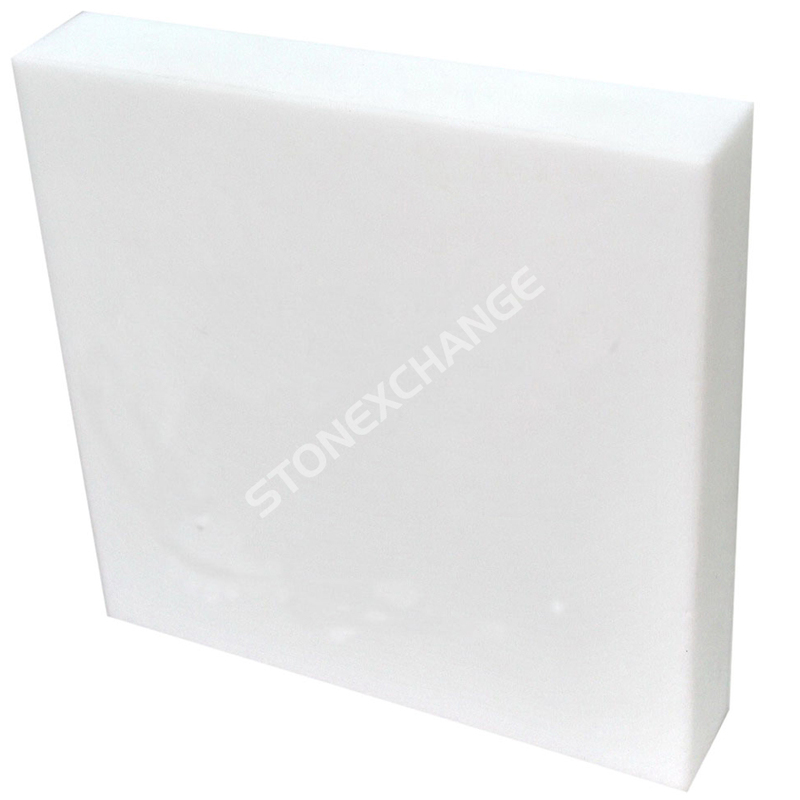 Typically manufactured overseas in China and then imported, this product is very similar in appearance to pure white thassos marble, but it carries a much more attractive selling price. It’s very durable and has a fantastic shine that can brighten any space and make it look larger. It has many benefits to offer, including being heat resistant, nonporous, recyclable, and highly durable. While thassos marble is formed over the years by Mother Nature, nano glass tiles are made through a manual process. It uses all natural materials in the production, including 75 percent silica. The liquid mixture is blended for perfect consistency and then poured into a mold in order to form a slab or tile. The mold is then heated to 1,550°C or higher, and that temperature is maintained for more than 24 hours. This causes the glass molecules to align on a nanoscopic scale, resulting in an incredibly hard surface. The slabs or tiles are then prepared for shipment. This product is actually surprisingly strong. Continuous blade saws are used to cut the material, but it can also be chiseled, honed, or sandblasted. After being cut to fit, the tiles or slabs are generally attached to a substrate using clear resin. It’s important to install all nano glass using the special clear resin to avoid discoloration of the glue as it’s exposed to UV rays. Once it’s installed, the surface is ready for use. There’s no need to have the glass sealed like stone, but some customers may choose to still apply a sealer for an extra level of protection against stains. Contractors who work with this material on a regular basis may choose to invest in special tools and saws that can cut the glass with ease. Many natural stones will absorb some level of water, but this isn’t a concern with nano glass. It actually has zero water absorption, so it’s ideal for use in bathrooms and high humidity areas. Unlike some stones that must be sealed for protection, you don’t have to worry about nano glass becoming stained. It’s also resistant to scratching, and that makes it a popular choice for everything from commercial bathrooms to personal kitchens. It can even be used on building facades where you want a material that won’t be harmed by water or extreme temperatures. Available in slabs and tiles, this material provides customers with plenty of design options. Use the slabs on counter tops and kitchen islands. Make good use of the tiles for backsplashes, bathtub aprons and other vertical applications. It also makes excellent windowsills because it won’t be harmed by the sun or the elements. The perfect contemporary highlight, it can actually be installed in areas throughout a home or commercial project. Glass tiles in all colors are very popular right now because of their shine. Greater light reflection moves more light through a space and will make it appear larger. With the white color and highly polished finished, Marmo glass comes close to giving you a mirror-like reflection. Small spaces feel larger, and large spaces become more impressive. While this material is commonly used in bathrooms and kitchens, it can also be used in offices as a work surface. Install it as the riser of the grand staircase in your next hotel. Use it as a surround for the company logo in the foyer. It attracts attention and brightens a room without being overwhelming, and that makes it appropriate for almost any application. Some customers don’t like the idea of natural stone because of its rarity and how long it takes to form in the ground. These customers will love nano glass because it’s eco-friendly. The shavings and trimmings from manufacturing can be recycled and reused. The tiles themselves can last for an incredibly long time, but customers will love knowing that the marmot glass is 100 percent recyclable in case they ever grow tired of it. It’s also non-radioactive, and that makes it a top choice among people who are concerned about health or other risks. If you want the high-gloss of marble with the durability of granite, then nano glass is the right choice. It can withstand regular use, heat and water. It’s not prone to staining, and it’s incredibly durable. At the same time, it’s a beautiful product that closely resembles the more costly pure white thassos marble. Nalboor offers this product by the crate, so you can save with our wholesale pricing. As the order size increases, our prices will drop to help you save more. We offer tiles in a range of sizes from one-foot by two-foot rectangles to four-foot squares. We also carry smaller tiles that are perfect for backsplashes and other accent areas. This allows you to customize the designs of any project to perfectly suit your needs and your customer’s style. We offer quick shipments and great prices on all of our nano glass, so contact us today for nationwide shipping.